i figured the question gets asked enough, so i'd make yet another faq. what are red/clear tail lights? i have a 1990 coupe, can i put red/clear tail lights in? i have a 1990 sedan, can i put red/clear tail lights in? 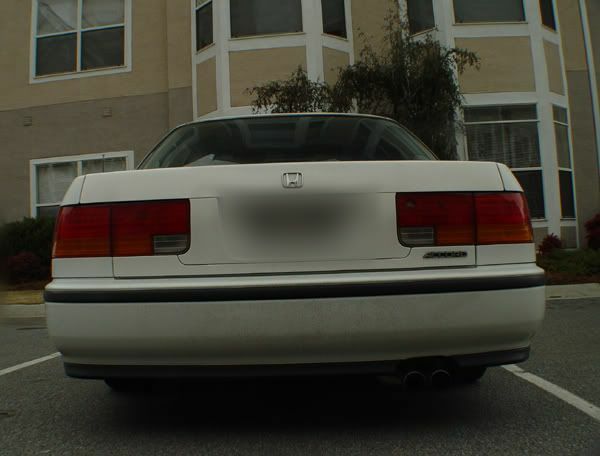 i have a 1991 accord coupe, can i put red/clear tail lights in? 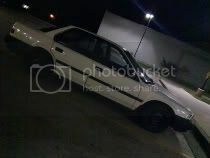 i have a 1991 sedan, can i put red/clear tail lights in? 1990-1991 coupe and sedan tail lights are the same! the tail lights for 1990 coupe will fit a 1991 sedan and vice versa. i have a 1992 coupe, can i put red/clear tail lights in? with a stock coupe trunk, no. manufacturers do not make red/clear tail lights for 1992 coupes. 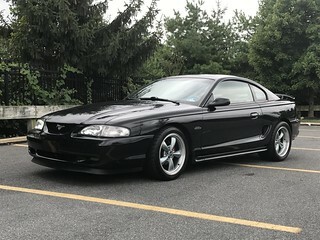 i have a 1993 coupe, can i put red/clear tail lights in? manufacturers do not make red/clear tail lights for 1993 coupes. i have a 1992 sedan, can i put red/clear tail lights in? i have a 1993 sedan, can i put red/clear tail lights in? why do 1992-1993 coupes get shafted?! honda decided that our beloved cb7s needed a minor facelift after the 1991 edition... that the coupes and sedans needed distinction. thus, different tail lights were chosen for the coupe and sedan. well, i own a 1992-1993 coupe, and i want red/clear tail lights! what can i do?! well, i suppose you could try and convince manufacturers to make them, and help all coupe owners out! you cannot make the oem tail lights into red/clears... in other words, the amber/orange reflector is not removable. but, you could do a trunk swap! either you could swap on a 1990/1991 trunk (coupe or sedan would not matter, as they are the same), or you could swap on a 1992/1993 sedan trunk. the 1990/1991 trunk is likely more difficult, as the red brake lamp is below, and the turn light is above... which is reversed from the 1992/1993 lights which have the red brake lamp above, and the turn signals below (if confused, refer to pics above- phatdoughnut versus cpmike). you've mentioned this trunk swap... what does it take to do it? cpmike has come through and provided us with the info on that. what tail light bulbs will i use in the red/clear tail lights? use stock in the portions that are red. use amber in the portions that are clear, to avoid being hassled by the police. use stock in the portions that are clear if you don't care about being hassled, or don't think you'll be hassled. oh where oh where can i find a set of red/clear tail lights? Last edited by uncle_el; 06-16-2005 at 04:01 PM. yeah right now i got a set of all clear tails, i wanna do them all red except for the reverse light area. but i cant seem to find any transparent red paint; ive checked out walmart, orielly, autozone, pepboys, etc. do you know where i would be able to find some? last set that i had, i had them painted at the same place i got my car painted. i dont want to pay 60 bux again if i can do it myself. oh yeah, i should've known that; i worked at Michaels for over a year. you ever heard of a brand called testors? they make a transparent red, but after seeing how my friends tails came out, i wasnt sure bout using it. guess he just sux at painting. Anyone know how to make the reverse lights clear? I've got a 90, and i really dont like the orange/amber lines that go across it, I'd like to have it be completley clear... I had the tails out to fix a leak a little while ago and i concidered just breaking that crap out that's in the area where the reverse lights go, but i didn't want to break 'em... I was thinking about investing in a pair from a junkyard and experimenting, but clearly, that plastic isn't completely orange/amber like the rest of the lights, so maybe those little orange things can come out? anyone know or experimented before?? TSM Garage: Honda/Acura, VW/Audi, and Subaru performance and maintenance work. The people on e-bay selling tail lights sometimes say that they will fit the sedans, but not the coupes. Should I assume that this is just a lie? 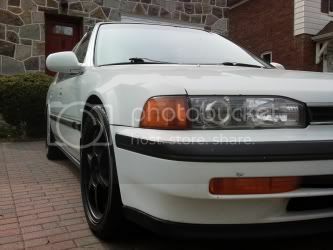 All tail lights that will fit a 91 Accord will definetly fit all models correct? SAE/DOT certification- does it really matter as long as you use amber bulbs for turn signals? MEMBER OF THE SOUTHERN CALIFORNIA CB7TUNERS! Depends on the inspector. They can fail you for it if they want to be pricks, but most will pass you with amber turn signals. Most red/clears leak right? Where on the taillights should you seal with clear silicon? Around the entire perimeter between the lense and housing? What about light leakage, do all of the red/clears leak white light around the top of them? or is that just certain types? After 17 years and 208K miles, I'm not "tuning" my CB7, I'm "restoring" a CLASSIC. 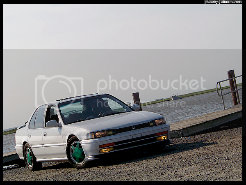 I have a 1992 Accord Wagon.........does anyone make red/clear taillights that will fit it? The lights seem to be different from the 1990-91 tails, but definitely not the same as the 1992-93 lights either.......am I screwed? the red and clears wont pass stte inspection, they are not DOT approved. Well it really Depends on the inspector. I failed the inspection because of it a couple years ago. 1. TypeG might agree with me on this, but now is a good time to CLEAN. Once you have the old OEMs off, take this time to clean all new contacting surfaces. Get a rag(i used a clean, unused paint brush--strictly used for removing dust/dirt) and clean off all the dust and crap thats built up behind/between your tail lights for the past 15 years. Inside the car and out. I didn't use any cleaning agents by any means, i just made sure clean up all that dust and dirt. 2. I wouldn't call it "fitment issues" but mine were not a smooth, clean-cut, flawless fit. I had to press here and press there and they're not 100% smooth. There's a few teeny gaps and they don't quite sit flush in a place or two. Its not really a big deal, but just something i wasn't quite expecting. 3. There was a handful of parts i chose to, and HAD to, remove/swap onto the Red/Clears. --3a. The "chrome" side-trim piece. It faces inward on the inner lights. On the OEMs, this piece is black. I removed the old black piece and placed it on the new lights. And depending on your tastes, they do sport a chrome trim around them that is fairly noticeable, at least on an Arcadia accord, it is. Some or most have painted this. I'm leaving it for the time being to see how it fairs. If i don't like it, i may end up painted it black, or maybe even Arcadia, to match. You shouldn't have any trouble passing inspection as long as you have amber bulbs in the turn indicators. Then again I am not too familiar with Missouri's Inspection policies. I just know that you are supposed to either have amber or red lights on the rear of the car, clear/blue lights are only allowed up front and in the reverse indicator's.